FileMS-1023 - Crimp, James Lidstone. Cassiar District; Gold Commissioner, Government Agent. FileMS-1024 - Nesbitt, James Knight, 1908-1981. Victoria; Collector. FileMS-1025 - Spearing, Robert L. Victoria; Collector. FileMS-1026 - Tait, John R., 1888-1978. Crofton; Author. FileMS-1027 - Lim, Li Bang, 1880-1974. Victoria; Businessman. FileMS-1035 - Hill, Elizabeth Jane, 1924-. FileMS-1039 - Mackenzie, John Peter. Military Engineer. FileMS-1040 - Gough, Sadie. Nanaimo. File MS-1027 - Lim, Li Bang, 1880-1974. Victoria; Businessman. 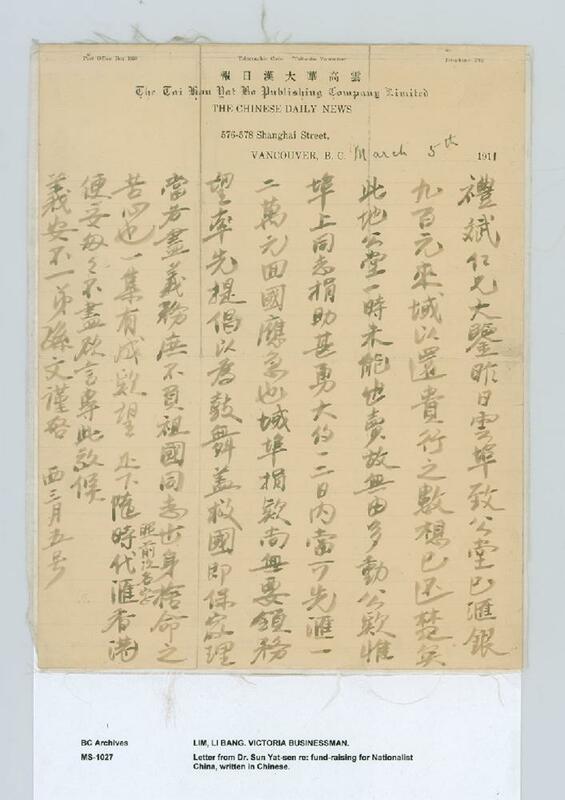 Letter from Dr. Sun Yat-sen regarding fund-raising for Nationalist China, written in Chinese. Presented by Fay Lim and Dickman Lim, East Saskatoon, 1975.